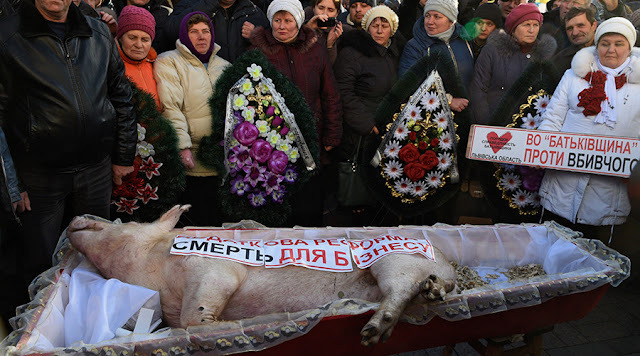 Activists who think that Ukraine’s 2016 budget screams death to the agricultural sector have brought a dead pig in a coffin to the Verkhovna Rada building in Kiev and held a mock funeral ceremony. The angry protesting farmers and their supporters demand to keep a simplified tax system and special VAT rules for the agricultural sector in 2016, something the announced budget lacks as Ukraine has to comply with the demands of its lender, the International Monetary Fund. Ukrainian website NB News reports that around 1,000 people came out to protest. They paid their ‘respects’ to a dead pig in a coffin while women in traditional folk costumes sang songs about the fate of Ukraine. The pig had a sticker over its body reading "Tax reforms are death to business." During the procession, scuffles between riot police and protesters erupted as the protesters tried to bring the coffin closer to the Verkhovna Rada.